All together: ahhh. With her little medikit and sweet mix of art and photos, Dr KittyCat will cure all your blues. Do you prefer: cute animals or brave rescues? Funny doodles or colour photos? No need to decide – this sweet series has both! It also has the rather awesome Dr KittyCat: a caring puss with lots of small furry patients. Plus her cuddly sidekick, Peanut the mouse. Now, that’s quite a lot of cute. Do you need even more? 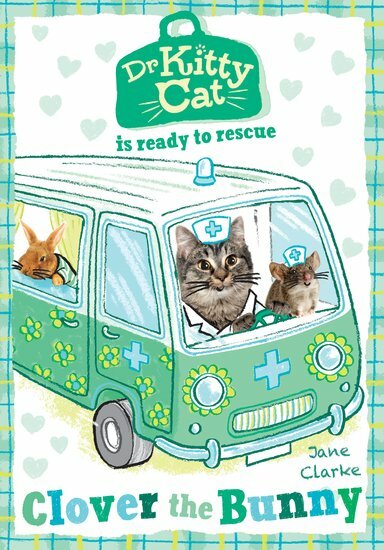 Well: Clover, a fluffball of a bunny, needs help… Don’t wait until you’re sick to call Dr KittyCat. Laugh yourself healthy with this cuddly treat.